This very special Exige is 1 of only 1 produced specially for The Goodwood Festival Of Speed where piloted by Gavin Kershaw she recorded the 2nd fastest time for a road car (5th Overall) up the world famous Goodwood hill. The car also features on the front cover of the 2018 Lotus price and options brochure. The pinnacle of the Exige range the Cup 430 comes as standard with supercharged and charge cooled 430bhp V6, 6 speed manual gearbox, Nitron adjustable dampers, baffled sump, titanium exhaust system, AP Racing J Hook disc brakes along with a host of lightwieght carbon fibre features resulting in a dry weight of 1056kg. 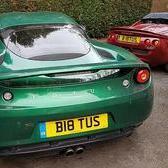 The post 2018 EXIGE CUP 430 TYPE 49 (1 OF 1) appeared first on lotusforsale.com. This sold within 14 hours of being listed! Good price for a 430.